References to Champapuri are found in both Ramayana and Mahabharata. However we can also find traces of this iconic ancient city in earlier mythology as well. The legend of churning of the ocean by the Devas and Asuras in search of the holy nectar of immortality is well known to any reader of Indian mythology. What many may not know though, is that the venue of the event was in a place called Bhagdatpuram, which meant the ‘city of luck’! Mount Mandar was used as the pivot for the churning and the benevolent snake god Vasuki offered himself as the rope for the churning process. Mount Mandar, a 800 feet high granite hill still stands today at Bhagdatpuram, its sides bearing the indelible marks of the coils created by Vasuki’s body acting as the rope during the churn. There are impressions of a lot of relics from the bygone ages on the hill. However, the venue Bhagdatpuram, across the centuries has gathered a colourful history. In the epic Mahabharata, the region and city was referred to as part of the Anga kingdom and was gifted to Karna by the Kuru prince Duryodhana. Karna ruled the Anga kingdom from a magnificent capital named Champapuri which is said to be on the same locales of Bhagdatpuram. Later, the city of Malini was also gifted to Karna by Jarasandha, King of Magadha, and was included in the Anga kingdom. In later Vedic period, the Anga kingdom flourished and the kings ruled from its capital Champa, until it was included as a part of the Mauryan Empire of Magadh. We find a handful of rock-edicts, inscriptions and caves with Ashoka’s inscriptions that talk about the Buddhist influence in the place. Later, the Guptas, built Hindu temples and patronised the city during their reign. Dharmapala, the Buddhist king of Gauda (Bengal), in the post Gupta period, extended his sway over Champa and the Anga kingdom and the region saw flourish of the Mahayana Buddhism traditions and culture. Dharmapala is also credited with establishing the Vikramshila Mahavihara (university), a short distance away from Champa. During the reign of King Harsha in Kannauj, between 606 and 650, the Anga kingdom came to be included in his empire as it was acceded to him in the battle with the Pala kings of Bengal. The entire eastern region flourished greatly under Harsha and was popularly called Anga-Banga-Kalinga (Eastern Bihar, Bengal and Odisha, in modern day geographic alignment). The famous Chinese monk and pilgrim Hieuen Tsang visited Champa in the 7th century and wrote about a large harbour situated at Champanagar (now known as Champanala) on the Ganges, which flowed through the western boundary of the city. Later excavations carried out in the 1970s, in the place, revealed relics of boats and coins even from the Middle and Far Eastern countries, which signify that Champa was an important centre for trade. Following the Muslim conquest of Hindustan by Qutbuddin Aibak, Iltutmish and later the Khilji dynasty, the place gradually changed its character and came to be annexed by the Khilji generals of the Bengal province. By then the ancient name of Champapuri had disappeared and the exact location of the city had also become blurred. 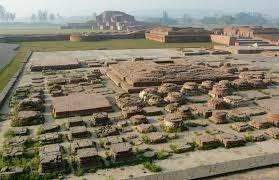 The scattered settlements in and around the area came to be known as Bhagalpur, a name adopted from the mythological name of the city: Bhagdatpuram. Bhagalpur thus remained under the Muslim province of Bengal thereafter. During the reign of Mughal Emperor Akbar, Bhagalpur was passed to the Delhi Empire when Akbar’s forces conquered Bengal, and remained a part of it until it was given away to the East India Company in a grant by the Mughal Emperor Shah Alam II in 1765. Bhagalpur acted as a very important centre for trade and commerce in the Bengal Presidency during the British Raj. Though the name Champapuri has long disappeared, the city still lives on, albeit in a different character and a successful city in the modern times. Bhagalpur, included in India’s recent ‘Smart City’ development programme, has always lived up to maintain an appreciable balance of its heritage and tradition while surging ahead in modern development. I am participating in the #BlogchatterA2Z challenge and today’s letter is ‘C’. Hi Deepa.. thank you for reading my blog and for the comments. Glad that you liked it :) Yes, I will surely read your posts and leave my comments.. could you please share your blog link? Hi Deepa.. thank you for reading my blog and for the comments. Glad that you liked it :) Yes, I will surely read your posts and leave my comments. Hi Sneha.. thanks for reading and commenting! Happy that you liked it... I read your posts too and left my comments there. Great to know about Bhagalpur. A family of my father's friend now lives in Bhagalpur and we had been there for a wedding when I was in class 6th. I read a book on Karan and in that I found that Champa city was situated at the confluence of the Ganga and the Champa (now probably the Chandan) rivers. Now Champa river does not exists I guess!! So Bhagalpur is actually Champapuri! All these cities have their heritage dating back to the times of the Mahabharata and Rmayana. It was later after several invasions that the entire contour of India got changes and we have what we have. You are right Jai.. in the ancient times, or the Treta and Dwapar yugas (times of Ramayana and later Mahabharata) we had a fantastic and efficient society and kings ruled over brilliant kingdoms.. The story of these cities are testimony to that fact. Also, we are lucky that many of these cities still exist in modern times, albeit in changed form due to the invasions and influence of other cultures and races..